So, now that the obligatory holiday parties are coming up, it seems only fitting that I get excited for the holidays the only way I know how: BAKING! More importantly, DECORATING! The cupcakes were made for a holiday party I didn’t even go to. 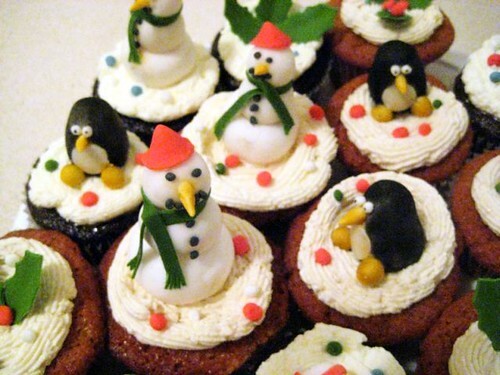 Still, it was a good chance to make some adorable penguins, snowmen, and presents for the tops of the cupcakes. The cupcakes were maple walnut cake with maple buttercream frosting, and chocolate cake with peppermint buttercream frosting. I had a lot of fun practising making these little figures, but it certainly was stressful, because I didn’t allow myself enough time to make everything. I felt like I was rushing. 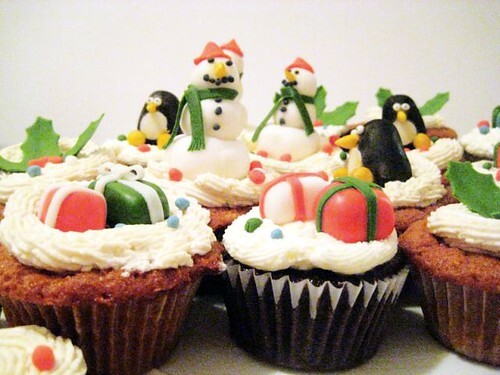 Those are awesome cupcakes! 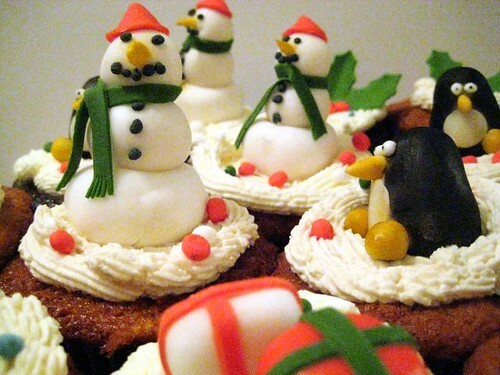 Love how the side shot makes it look like the penguins and snowmen are having a party. They totally were having a party! Except that one shifty penguin. I know he’s planning something, and probably trying to get the other penguins and snowmen to mutiny. I’m sure they’re organised! I dig the fortune cookies!